Again, I’m re-creating the wheel, hoping to make it better. My students responded well to the doodle notes I created for my Transformations Unit. One commented, “I’m really understanding the material now. Honestly, your class was a little boring, but this chapter was much better.” It’s amazing how turning the tables on students and asking them to work the examples before showing them what they should look like does for engagement. And adding color can’t hurt. Several said doodling with colored pencils was soothing. Yet they all respect the time and pack them up as soon as notes are finished. 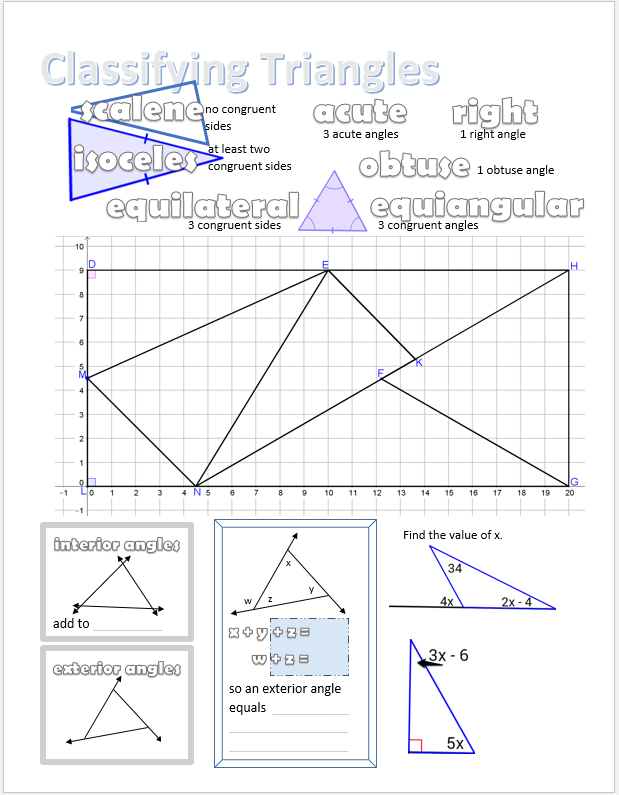 Here’s a Classifying Triangles Vizual Notes we’ll be using next week. I’m planning to have them ‘divide and conquer’ when it comes to the big middle mixture of triangles. A triangle per pod or so to find side measures (if possible since two points aren’t given) and angle measures. Who doesn’t need practice with a protractor?